In neither of my two games am I ever on the cutting edge. Part of this is that the “race” to experience, then to write about, new developments can take away the enjoyment of playing. So, although the LOTRO Legendary Servers launched a couple of weeks ago (at the time of writing) I’m only just now putting my thoughts down. Another reason for the “delay” is that new things tend to come with teething issues. Being an ex-programmer I know this is normal and that developers need time to fix things and let the systems calm down. In the era of Social Media it can be too easy to criticise imperfections rather than celebrate the positives. I don’t want to be one of those people that fan those flames! So what follows are my current thoughts on LOTRO’s new “progression servers“. Feel free to add your own comments at the bottom, while comments are open. What is a Legendary Server? TL;DR Should You Play There? While many hoped for a ‘vanilla’ server – one which has precisely the same code, regions and set-up from when the game first launched – a legendary server is different. On the two servers – Anor and Ithil – the original Eriador map regions and Shadows of Angmar content, along with a level cap of 50, are available. It is also only available for current subscribers (VIP), which includes life-timers. It contains all the landscape improvements, new classes and trait trees that exist on the live servers, but were not in place ten or eleven years ago. SSG call this set-up a “progression server” – one where all players start again from Level 1, with no currency, outfits, crafting material banks – anything! Well, excluding any account-wide bundles you may have previously purchased from the LOTRO Store anyway. The aim being that players level together (or thereabouts) and can enjoy group content that on a live server it can be hard to find fellowships for. Legendary Servers Anor and Ithil have a -40% XP debuff. This encourages engaging with more quests than you might be inclined to do otherwise. I’m likely in a minority that still does a lot of trivial quests (those that give minimal, or no, XP) on the live servers. By levelling slower, grey quests happen later in your questing. This, by the way, is a good thing. Now, I don’t actually think difficulty has been increased (though I am happy to be corrected!). It wouldn’t make much sense to do class balancing on the live servers but not on legendary ones. But because of slower levelling, it isn’t difficult to be at least 2 levels under the foes you are facing. Lower level means lower-quality gear too, which adds to the perception of difficulty. Players do not so easily earn “the Undying” title any more. It is thus more of an achievement to actually reach level 20 without being defeated! This added dimension is one reason of many that I won’t be spending the majority of my time there. But I understand that many people do like a challenge – and some may even enjoy a challenge. I’m just not one of those people, and that’s okay! Why are LOTRO Legendary Servers for VIPs Only? My actual answer to this is “why not?”. In the “real world” current customers may be given extra benefits by a business. This may be as a thank you to existing customers, but also as an incentive for others to sign up. It makes business sense, but also such offerings are what I would call “serendipity” for current customers; giving something new to honour VIPs for their financial commitment to the game. Before the legendary servers, people were VIP and enjoying the benefits of that. This is a new product that existing subscribers did not need to further buy into. I’m sure SSG’s business case was more complex than this! This would have meant substantial hardware purchases, security set-ups and staff time to implement – at their cost, I might add. But having seen comments on social media and from other LOTRO streamers, the Legendary Servers have reignited excitement into the community. It has encouraged former players to come back and new players to come and subscribe to the game. It was likely a “measured gamble” from SSG (financially-speaking) but I suspect it will pay off. I have only been playing the Lord of the Rings Online for about three years. My highest level character is still pushing towards Rohan. I have a lot of “new” content and storytelling still to experience! 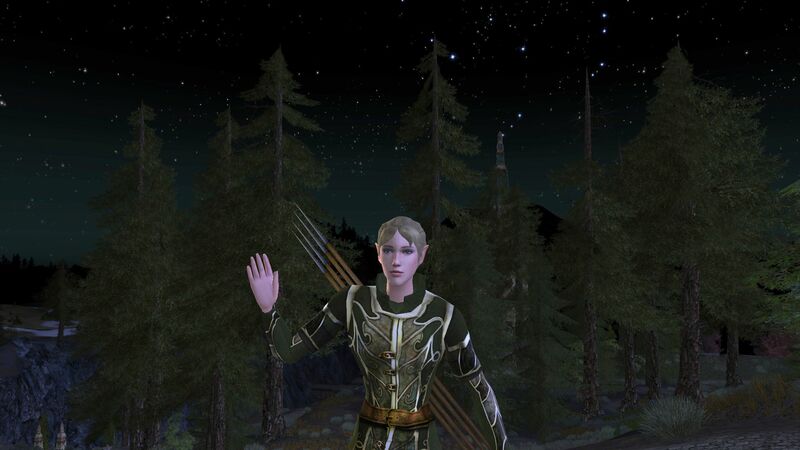 Because of this and connecting to my own LOTRO characters, I’m only on Anor once a week (else I’ll never see half the stuff SSG have created!). Groups Forming: People asking to group up for quests you can now solo (e.g. Retaking Weathertop where a clear Solo option is presented). Players are also grouping up for old instances – e.g. Fornost and Agamaur. Fledgling Market: People trying to trade or sell low-level crafted items at reasonable prices. This may, of course, change later on but it does not detract from it being a good thing right now. More characters in the starting zones, even weeks after launch. The first regions of The Shire, Ered Luin and East Bree-land on the live servers are still populated by the way, but more so on Anor. People not levelling quickly: A few hit Level 50 within the first couple of days (craziness!) but it’s nice to see kin people not speed-levelling and enjoying the earlier regions again. Reinstated Quests: SSG have brought back legacy quests that do not appear on the live servers. Which, for me, means new quests! In Archet, for example, there is a quest to defeat giant flies in return for a stack of dyes. Reinstating old quests is a way for veteran players to feel a bit of that ‘transported back’ feeling. And for newer players to experience quests they have never seen before. Multiple Languages in Chat: while this can, and does happen on the live servers, the Legendary Servers are not segregated by geographical regions. This meant people from all over the world can choose to play together, where previously they may have only engaged with a region-specific server. Festivals: I’m making a guess, but I think players who have been around many years may engage with festivals (e.g. Fall Festival and Yule Festival) more, at least initially. You don’t have a huge bank of reputation mounts, so getting a new mount on the Legendary Servers will be an enticement. With a blank wardrobe, we’ll all need new cosmetics. And with a developing market, the pets will no doubt make their way to the Auction House for those who want to amass coin. These a personal observations, and may not reflect others’ opinions (yada, yada, small print etc). I haven’t called them “negatives” or “disadvantages” because I don’t think they are either of those descriptions! Gathering nodes in short supply: this may ease off once the initial excitement calms down a bit, but I know I struggled to get sufficient copper ore in Ered Luin. Other players however said they levelled in Ered Luin but went to The Shire to gather copper, so levelled their crafting as a separate exercise. However, it wouldn’t be a bad idea to speed up the respawn rates of gathering nodes. Fear of Missing Out (FOMO): SSG will be releasing new expansions to the Legendary Servers every four months (or thereabouts). This means if I want to keep levelling with Kin-mates, or even potentially do the odd fellowship quest, I would need to keep levelling. On one day a week, I won’t keep up with people. And after a year I may be so far behind that my situation of not easily getting help if I need it, may be the same as on the live servers. But I’m trying instead, to see my day a week on Anor as a day I focus on just one character, with others simply supporting via crafting. Fewer Kin-mates on the Live Servers: part of how I enjoy an MMO is less in group content, but more on chatting with other players. Since Anor (and later Ithil) launched, my kins on Evernight and Crickhollow have been very quiet as many seem to be focussing on legendary. This has been difficult and is sort of like FOMO above. But again I’ve taken a different view: my kin-mates are enjoying playing LOTRO their way, and I am enjoying playing LOTRO my way. The important thing is people engage with the game and want to spend time playing it. But I do hope that those that are on the Legendary Servers do come back and spend good time on the live servers as well. No Wardrobe! It’s totally understandable that we can’t simply transfer our wardrobe of outfits across servers. But as outfitting a character is a vital part of working out who they are and to be different to other characters I did miss it. Not so much now, as you can get free cosmetics from the Beorning and High Elf introductions (which makes a total of four outfits’ worth of components). And you can pick up some cheap outfits from, wait for it, the Outfitter vendor, for just a few silver. Gear/Mount Envy: At the moment, it is really evident those that have (or have had) extra finance to spend in-game. From pre-order mounts to LOTRO store exclusive cosmetics, it is hard not to feel “poor” if you don’t have real-world money. However, the offline world works the same – and those that can spend money should be allowed stuff if that’s how they choose to spend it. Just focus on your own game, run the deeds, earn the LOTRO points, then treat yourself from the Store. TL;DR Should You Play on LOTRO’s Legendary Servers? There is no “should”! If you’re a VIP and you want a different way to engage with the community, then go for it. If you want a bit of a challenge, or to engage in Fellowship Quests that you never have before due to a lack of groupies, then it’s definitely for you. equally, if you like to level slower and engage in as many quests as possible and get rewards for doing so, then it suits your gameplay choice too. SSG answer a wide variety of FAQ’s on their official launch page. I’d suggest you check it out before choosing to play on Anor or Ithil. The LOTRO Legendary Servers can supplement your existing gameplay, while adding a different dimension to it. It will be interesting to see, as time progresses, whether the excitement continues as expansions are released. As new character creations are likely to slow down as people get “further behind”, it may still encourage existing VIPs to keep spending their time and money on Anor and Ithil. If that builds the community and mean people enjoy the game more, then what may have started as “serendipity” may well turn out to be a boon to SSG and the future of LOTRO. I’ve only been playing LOTRO a few months now (with VIP). I got the no-xp item to slow down leveling. As I’m new to the game with only 1 character and only up to around level 20 (I do lots of the quests just to experience the world), I don’t really want to start over on a legendary server. My other issue is the VIP requirement. I may wish to quit paying at some point and just play f2p for awhile. Would I be able to transfer a character off of the legendary server to a live server?